Remodeling your bathroom can be trickier than you might imagine. If you’ve set aside a carefully thought-out budget, you don’t want to exceed that budget. After all, you’re probably looking ahead to your next renovation project, such as redoing the kitchen or upgrading the hardware on your front door. Follow these tips on how to make your bathroom more beautiful without spending too much money all at once. While you want to make your newly-redone bathroom as luxurious as possible, that doesn’t mean you need to go over the top. 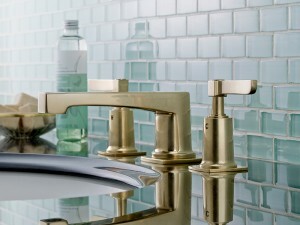 Consider accenting your bathroom by getting a pop of color from your metal fixtures. For instance, play around with using brushed metal in your bathroom. The drain and faucet should be clad in the same type of material, no matter if it is polished – chrome paired with nickel – or brushed – stainless steel and bronze. One of the fastest ways to rejuvenate your bathroom is to add more lighting. While taking advantage of natural light can help you feel more energized when you go about your daily routine in the mornings, you can’t always rely on sunlight. That’s why sconces for the lights in your remodeled bathroom can make a noticeable difference. The sconces need to be 4-5 feet off the ground so that light will catch the shadows on your face and in the corners and make it easier to see. If you’ve noticed that the shower door isn’t opening as easily as it should, then you should include it on your list of items to change during the bathroom remodel process. Whether the shower door slides back and forth or opens up from a stall, you can put in a new door that fits in the space more effectively. Either way, you won’t need to worry about the mess that an improperly-positioned shower curtain can bring, especially if that curtain hangs on a tension rod that is constantly falling out of place to clatter onto the bathtub below. Your bathroom can’t be finished without some new sinks. Whether you want to switch out the design, you currently have or replace them with something radically different, having a new sink can fit in with the overall theme of newness in your bathroom. This entry was posted on Friday, February 8th, 2019 at 4:24 pm. Both comments and pings are currently closed.